This review first appeared in the March 3, 1995 issue of the North County Blade-Citizen (now North County Times). 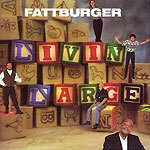 Local combo Fattburger, that late-night smooth jazz combo that went from packing them in at the now-defunct Old P.B. Cafe in San Diego to the top of the instrumental music charts, is back with a new album on a new label: "Livin' Large" on Shanachie's Cachet jazz imprint. The problem with this new album is that the band holds the same easy-listening groove throughout every song. The band's hallmark has been its mix of R&B wtih pop-jazz instrumentals for a unique sound that lifted Fattburger agove the rest of the smooth-jazz crowd. Most of their albums have also featured one or two especially memorable tunes that grabbed your attention. But none of that is present here  not the sn apping bass lines laid down over a funked-up percussive groove, not the soaring melodies. "Livin' Large" just kind of coasts along, not heading anywhere, and never arriving.